Microsoft expects to see 30 Windows Phones in time for Q3 2010? There have been some trickle of news regarding Microsoft of late that's surely going to continue to garner some attention with the launch of Windows Phone 7 nearing ever closer. 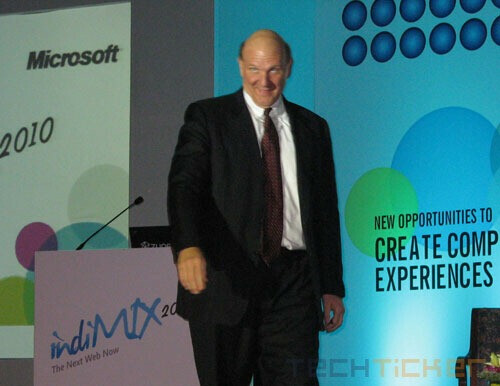 This time around we're hearing something coming out of Microsoft's IndiMix 2010 conference where Steve Ballmer himself let out some information from a presentation slide. The one specific slide mentioned that there were 50 Windows Mobile handsets launched all of last year, but something else clearly stood out for attendees during the event. Although it may be somewhat unclear, the slide claimed that 30 Windows Phone models would be coming during Q3 2010 – which is going to commence very soon. However, it does not specifically say how many are Windows Mobile based, Windows Phone 7, or the KIN-like Windows Phone platform. It would be extremely interesting if Windows Phone 7 handsets become real during this quarter – which should be impressive in itself seeing they're expected to launch just in time for the holiday season. You are a tool. Windows 7 Phones will be directly compatible, have standardized hardware requires, and thus all be required to be somewhat high end. What plagued windows in the past was the massive diversity in specifications that were allowed to run on the platform. Android is also starting to experience the problems with running too many cross-spec'd phones. Windows 7 Phones will explode out of the market, as long as they are marketed correctly, and they will come out swinging... hard. i think that picture will be a mandatory locked wallpaper on the screens background. i'm not buying either cause you know its gonna be stuffed with blootware. i don't need a phone to run my home or be a mobile computer i want a simple clean OS thats basic with small things i want and the ability to add to it if i want, oh wait thats android nevermind haha. Why does Steve Ballmer always look like a child predator? Yea, I remember that picture....Looks like he jumped right out of a nightmare!